Friday Faceoff: Should Excessive Burnouts Put Teams on the Hot Seat? Home / Amy Henderson / Friday Faceoff: Should Excessive Burnouts Put Teams on the Hot Seat? Three races into his return, Tony Stewart is making up some ground on 30th in points, the Chase cut-off for a driver with a win. How likely does that win look for Stewart in the next 15 races? Clayton Caldwell, Contributor: I hate to say it, but not very likely. I think Stewart-Haas Racing/Hendrick Motorsports are behind the game a little bit. However, the interesting tracks are going to be the road courses and Indianapolis Motor Speedway. It’s his final year, so going home to Indianapolis you know they’re going to put a lot of effort, time and money into the car Tony Stewart races. But Joe Gibbs Racing has dominated the season so far, though, and I see that continuing for the near future. Aside from about four races, I don’t think his chances are really good. 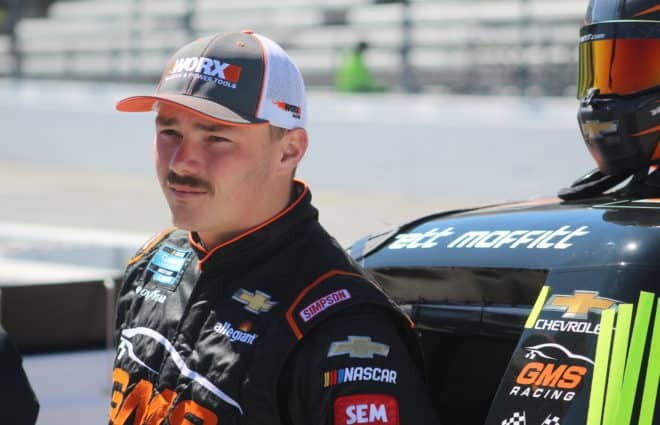 Sean Fesko, Staff Writer: Stewart looks as though he’s figuring out the new low-downforce package nicely, with an average finish just outside the top 10 through three races. 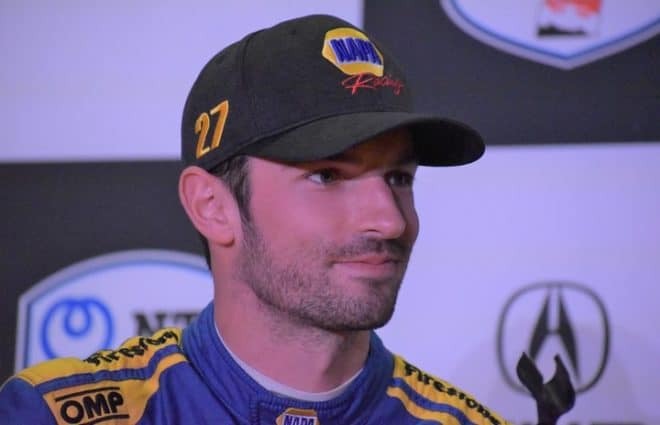 Assuming he can continue to figure it out, wins could come at tracks like Pocono Raceway, New Hampshire Motor Speedway and Indianapolis – flatter tracks that he has had success at before. The road courses, too, could be kind to Stewart. We all know how great he’s been there. Vito Pugliese, Senior Writer: Very likely. Mark me down for picking him to win either the Coca Cola 600 or at Daytona International Speedway in July. NASCAR has a habit of producing happy ending stories; this will likely be one of them. Phil Allaway, Newsletter Editor: So far, Stewart is running quite a bit better than he did last year. However, I still feel that he has a ways to go. He needed to pick up his performance from last year to be able to even get into the top 30 in points. I don’t think the No. 14 is a winning team right now, though as Stewart gets more and more comfortable in the race car, that might change. If you’re looking for a percentage chance of Stewart winning between now and Richmond, I’d say around 15 percent at best. Bryan Gable, Staff Writer: It is hard to say for sure, but Stewart has not looked like a week-in, week-out contender for wins for several years. Seeing him get one more victory would be a great story, but at this point it looks like that victory would have to come via fuel mileage or other pit strategy. Stewart has proven his doubters wrong before, but the No. 14 team does not have a race-winning level of performance right now. NASCAR took a close look at Kyle Busch’s car after Kansas in an ongoing effort to stop teams from manipulating the bodies of their race cars. 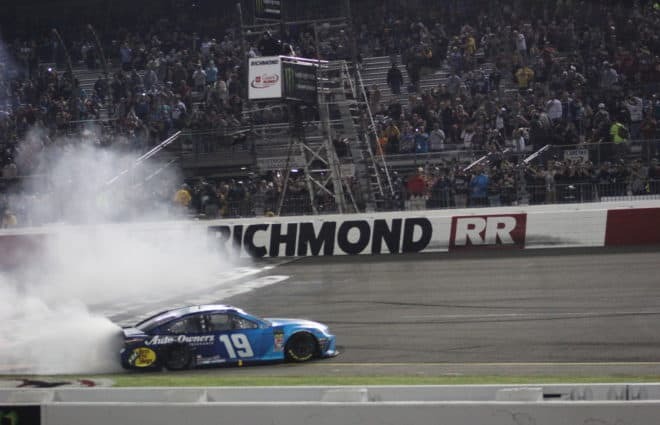 Should NASCAR penalize teams for post-race alterations that come from celebratory burnouts if it makes it impossible to accurately inspect part of the car? Dustin Albino, Contributor: There is always speculation on the victory celebration following a win. I don’t think teams should be penalized after just racing their guts out. But it does raise an eyebrow as to why drivers celebrate the way they do. Is there a code word? Is there a reason for it? There should always be a celebration — the driver earned it — but what is excessive and what’s not? Amy Henderson, Senior Editor: NASCAR absolutely should not penalize anyone for anything based on speculation, what they might have done. That said, they most certainly could — and should — institute a rule stating that if the body is altered by the burnout in such a way that full post-race inspection cannot be completed, there is a separate penalty for that. I’m not saying they should get a suspension, but a fine, a few points and probation through the end of the season? That’s totally reasonable. Teams can celebrate without hurting the integrity of the cars. 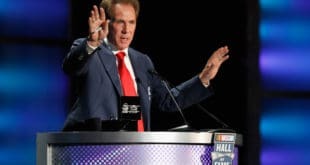 Mark Howell, Senior Writer: NASCAR should penalize teams that alter the configuration of their car immediately following a race, even though policing such behavior seems nothing short of impossible. We know that post-race victory burnouts can trash an engine, and we’ve seen front clips/rear bumpers smashed in the excitement of a win, but to say that such damage was done intentionally in order to hide a rules violation is a tough call to validate. Unless NASCAR gets a hint from team communications, there’s little the sanctioning body can do. Pugliese: Yes. The burnouts are played-out and stupid; seen one, you’ve seen them all. That stuff isn’t done by accident, either. No team wants to have to hang quarters on a car again and fiddle with the body if it’s won a race. It’s done to mask something or draw attention away from something else — like, say, lug nuts glued into the rim, but not fastened to the stud. Jeff Wolfe, Senior Writer: I don’t think there is anything NASCAR can do if something happens in a post-race burnout that may have altered the car. Sure, it’s possible a driver could do something on purpose to hide a change, but with all of the public radio communications these days, it will be hard to hide if a driver is instructed to do something to alter a car during a burnout. The XFINITY Series instituted a Chase for 2016 (along with the Truck Series), and so far, just two series regulars have gotten in on wins. How many drivers can win their way into the show by September? Howell: While well intentioned, the XFINITY Chase format means little when Cup drivers take the majority of wins. I’m thinking/hoping that three or four more XFINITY regulars win their way into the post-season, but I’m guessing that that won’t be the case. What we need are more standalone events on the NXS calendar. Pugliese: How many races do we have where just the regulars run? There’s your answer. Allaway: I’m actually surprised that two drivers have already gotten in that way at all; I figured that would have been it for the season. 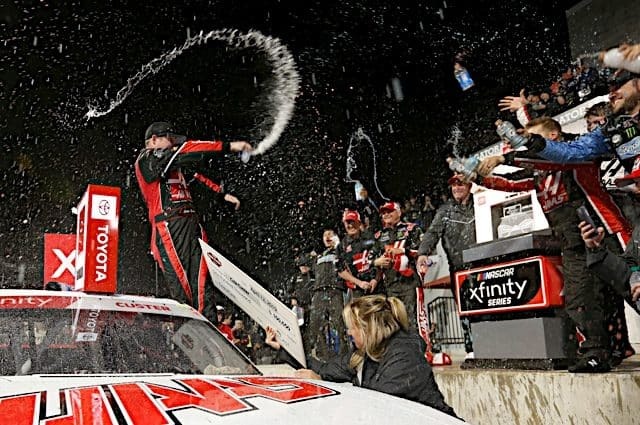 I want to say that only one or two more XFINITY regulars will win for the rest of the regular season. 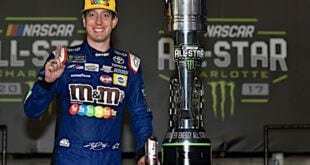 It’s hard to reach pay dirt, after all, when Kyle Busch enters 20 races a year and wins nine of them. 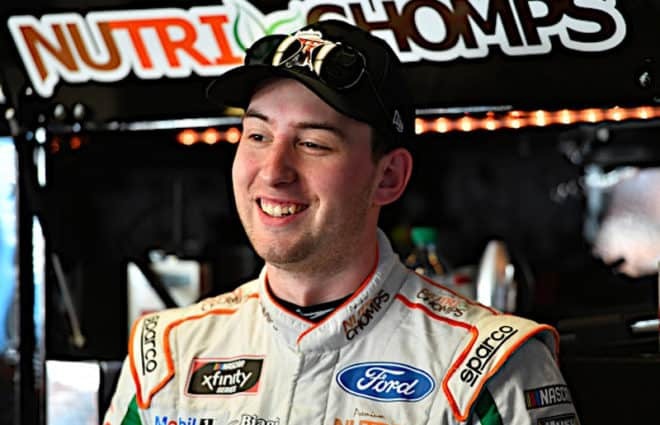 I’m thinking that Daniel Suarez will finally win and lock himself in, along with Ty Dillon. However, that won’t change who actually qualifies for the Chase, because unless Dillon and Suarez find a way to get suspended for a few races or get hurt, they would almost certainly make it anyway. Caldwell: Not many. I’m not sure what fans expected when Cup drivers win 80-85 percent of the XFINITY Series races a season. It’ll be interesting when the road course races come into play, because that could be an opportunity for an obscure name to be added to the mix, but I don’t see a ton of teams winning this year. It’s a series dominated by Cup drivers, even still. Fesko: Very few; Brennan Poole is looking stronger week in and week out, and Daniel Suarez is strong, too. 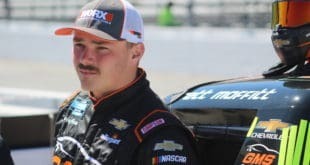 Justin Allgaier could sneak in a win, but other than that I can’t foresee NXS regulars winning races other than the standalones. One-fourth of the way through the season, which teams throughout the field need to turn things around in order to salvage their 2016 seasons before it’s too late? Gable: Kyle Larson needs a few good finishes in the next few weeks, or his Chase chances are going to go down the drain. Kasey Kahne is closer to the Chase cutoff, but looks to be stuck in another lackluster season. But Greg Biffle‘s year is perhaps the most shocking. Expectations were not super high for Biffle this season, but it is crazy that he is still without a top-10 finish in 2016. Caldwell: Richard Petty Motorsports, especially the No. 43 car and Aric Almirola. The team was a good run away from making the Chase a year ago and have a big-money sponsor in Smithfield on the car, but Almirola has struggled in 2016. I think it has a lot to do with the team hanging its own bodies this year, but the team still has had a tough season. Fesko: Clint Bowyer and HScott Motorsports have seen a few glimmers of hope in the last few weeks, but if they can’t continue to make more gains the season will be lost. Greg Biffle’s, too; that’s another team that needs to jump start its performance or start planning for 2017. Paul Menard needs to turn things around, as does Chris Buescher. Who thought the XFINITY champ would struggle this much in a car with support from Roush Fenway Racing? Howell: Kasey Kahne, Kyle Larson and Ricky Stenhouse, Jr. Decent runs every few races don’t cut it in the Cup Series. Glimmers of greatness need to become consistent performances that result in wins. Like it or not, the career clocks are ticking for these three. There are others in the same situation, for sure, but these three have their futures in their own hands. Allaway: The obvious answer here is Clint Bowyer’s No. 15 team. HScott Motorsports has been brutal this season. His teammate (Michael Annett) is the worst driver in the series that’s started all 11 races; they’ve been nowhere for most of the season. Beyond HScott, it’s probably Richard Childress Racing’s No. 27. Paul Menard has struggled quite a bit so far, and he’s lost his consistency that’s been the hallmark of his career with three DNFs already, and is getting beat badly by his teammates. Previous 4 Burning Questions: What Will Teams Do with Lug Nuts in Dover? Next NASCAR 101: Who’s Won at the Most Tracks? Pugliese, you have NO PROOF that the lug nut was simply glued to the wheel, so to suggest that is what the 18 team did is potentially libelous. Furthermore, the team stated all 5 lugnuts were unaltered stock nuts. Video of the last stop shows that the front tire changer did fail to tighten all 5, but there is no reason to allege anything beyond that just because it is FS policy to malign JGR racing whenever possible. Furthermore, how would Kyle’s burnout affect the freaking lugnuts????????????????? You are scraping the bottom of the barrel to join the FS chorus of denigrating every accomplishment of the 18 team. And you fail to note that video of mid-race pit stops showed other teams only attaching 4 lugnuts, (per Tom Jensen of Fox Sports). So, in your mind and that of NASCAR, mid-race cheating gets an automatic bye, but anything done at the end of a race, including the burnout, is automatically suspect. I hope giving up your integrity to work for an organization led by a guy fired by SI for failure to follow the ethics of journalism has proved worthwhile. But you can’t build a career on hatred of one man no matter how much arse you kiss.